Is it any wonder that Rock Rangers have a short life expectency? Remember the red one? It bit the dust. Or, more precise, I ground it into dust. Anywho, that meant I had to recruit a new sidekick. Without help I can’t do stuff only an idiot would do. Meet the latest Rock Ranger. I know, at 25 years old it’s a bit long in the tooth but like me it gets the job done. Someday I might show you what I had to do to get my new enabler. All I’ll admit to is laying a stone patio in return for the ‘new’ Ranger. Putting the truck to the test by hauling some moderate BFR*s to the landscape job site (a friendly ‘competator’) was on my own time. I couldn’t help myself from getting involved and taking over the work on the stream and waterfalls. I did get a very nice ‘tip’ for doing so. 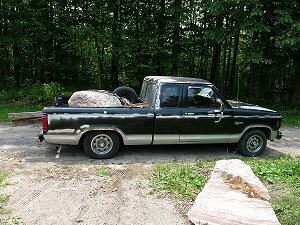 All things considered, I’d have done it all for my new Rock Ranger. I couldn’t be happier with the way it handles a load. This was one heavy BFR*. 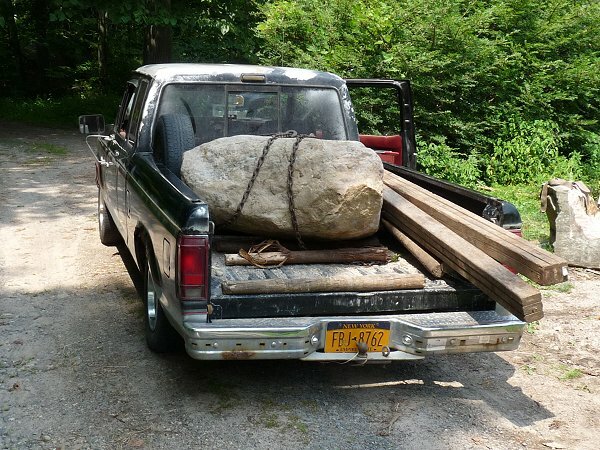 I guess it was well over a ton and one of if not the heaviest boulder I’ve ever hauled. The old Ranger just took it in stride. I can’t say the same for my ramps. One was snapped like a toothpick while unloading the beast of a boulder. 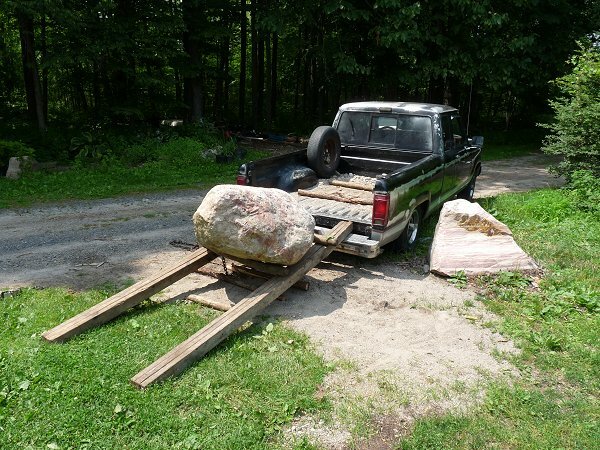 It had extended out from the bed of the truck and when it dropped it retired that ramp (3, 2x4s nailed together). 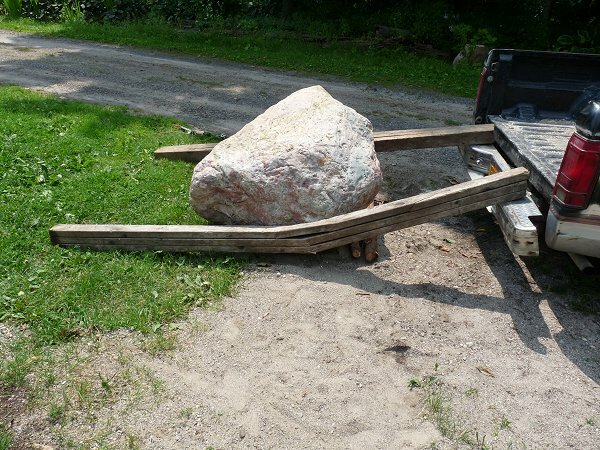 The ramp is now sideways after the boulder was carefully placed on the ground. On another similar occasion a ramp was broke entirely in two and the short end (2 feet from the lower end) ended up flying over the cab of the truck. It will be some time before I free the ‘rollers’ from under the rock. I will be hauling the beast again after I get done with beating some sense into it. I’m going to teach it how to be a boulder bird bath. Thank you for being so ‘loyal’. I won’t forget who you are and I know where to find ya. I’ll be back in the blogosphere someday when things lighten up a bit. 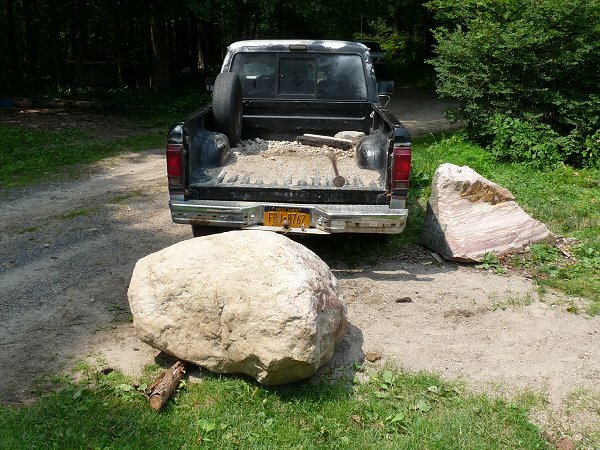 The original plan was to make this boulder into a disappearing fountain. I had to put a plug in that idea and turn it into a bird bath instead. I cleaned up and defined a path to the bulkhead using moss covered rocks and crushed stone. Once the rest of the area was mulched it became obvious that some kind of focal point was needed. Nothing wanted to grow under the hemlock tree in the full shade so I figured it was time for a BFR*. The home owner thought of a bird bath. I hammered out a compromise. Using a rotary hammer drill I drilled a circle of holes and used a chisel to chip out a rough hole about 4 inches deep, just enough to allow me to use the 18 inch bit to drill a hole through the boulder. (it was going to be a fountain) Getting the rough hole was the easy part and only took minutes using the hammer drill. The boulder sat in my yard for a couple months before I got back to it. I finished the basin with a 3 lb. hammer. I pounded on that rock for about 4 hours. It does look better wet. I’ll be making some more of these.